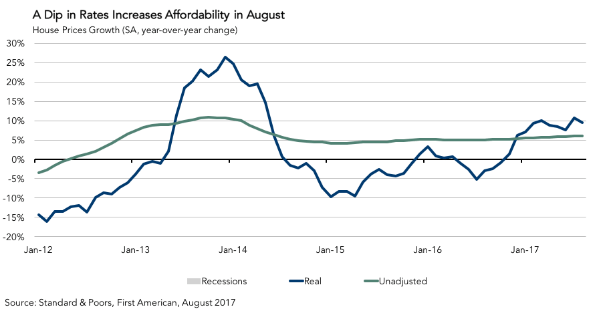 Affordability increased in August due to a dip in rates. Real house prices decreased 0.4 percent between July and August. Real house prices increased 9.6 percent year-over-year. Consumer house-buying power, how much one can buy based on changes in income and interest rates, increased 0.8 percent between July and August, and fell 3.2 percent year-over-year. Real house prices are 38.4 percent below their housing-boom peak in July 2006 and 17.2 percent below the level of prices in January 2000. Unadjusted house prices increased by 6.1 percent in August on a year-over-year basis and are 4.2 percent above the housing boom peak in 2007. “A dip in mortgage rates in August offset rapid price appreciation driven by the lack of supply, as existing homeowners remain reluctant to sell for fear of not being able to find something to buy. However, based on our RHPI, over the past 12 months affordability has declined by more than 9 percent,” said Mark Fleming, chief economist at First American. 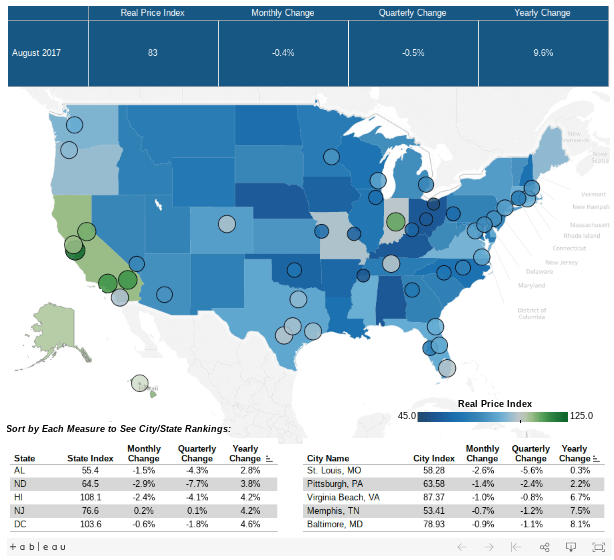 “Though consumer house-buying power improved in August, affordability is likely to fade as mortgage rates are expected to rise in the months to come, but lower affordability is only significant to potential first-time buyers. Existing homeowners with fixed-rate mortgages benefited from the rising prices with increased equity. If you’re renting and thinking of buying, then now is the time.